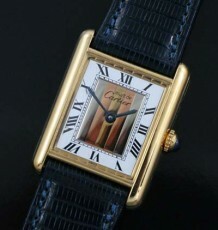 Stunning elegant Cartier watch with white dial and blued steel hands. 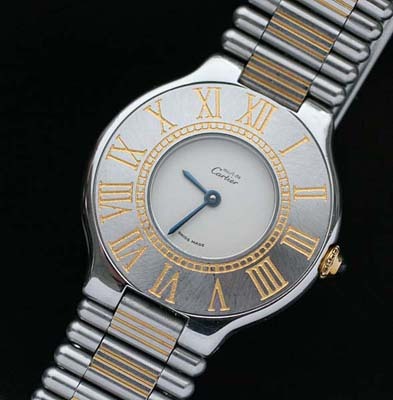 The Cartier 21 is a classic design that has been around for decades. 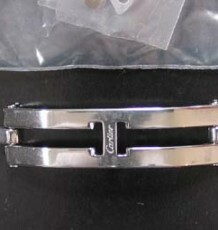 A classic Cartier design approximately 10 years old. The 21 design is one of Cartier’s most popular designs as it was one of the earlier metal bracelet models alongside the Santos and Panthere. 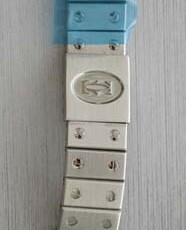 This watch is a unisex model that features a smaller white sub-dial and blue steel baton hands. The entire dial is ringed with an extra-wide steel bezel that is embossed with gilded Roman numerals and a gold minute track. The watch is fitted with a genuine Cartier quartz movement, which has been serviced and a brand new battery replaced. 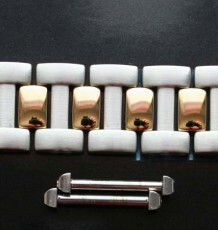 The steel and gold inlay bullet shaped bracelet is sized to fit a 7.75 inch wrist.